The reference library of the a.r.t.e.s. Graduate School is being compiled since the foundation of the school in 2009 and is being supervised by Wolfram Klatt, librarian of the Thomas-Institut. The collection of the a.r.t.e.s. library consists of handbooks, dictionaries and encyclopedias as well as primary and secondary texts of the different subjects of the Faculty of Arts and Humanities represented at a.r.t.e.s. Core areas of the collection are basic texts from the fields of anthropology, ethnology, media studies, cultural studies and philosophy. The collections currently consists of 1,200 books and is being expanded constantly. via the Kölner Universitärer Gesamtkatalog (KUG), where the collection is integrated in the collection of the Thomas-Institut. 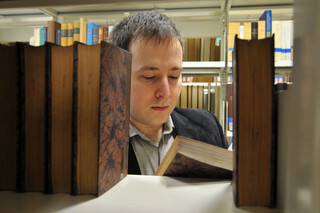 Every recorded book is provided with the footnote “Thomas-Institut / a.r.t.e.s.”. Furthermore, the location is denoted with “a.r.t.e.s. Graduiertenschule”. via the alphabetical and/or systematical card index on site. via the register in this document (as of August 2017, modifications may apply). The reference library of the a.r.t.e.s. Graduate School is open to all students of the University of Cologne during the opening hours of a.r.t.e.s. The lending of books is not possible.